The 2019 Ford Explorer embodies everything that Ford fans have come to expect from these vehicles. This year's line-up offers three solid powertrain options, a long list of standard infotainment and safety features, and a ton of comfort inside of the cabin. Although the Explorer does suffer from the third-row SUV segment's curse of having a cramped third row, many other positive aspects make up for this shortcoming. Everything on the 2019 Ford Explorer essentially carries over from the 2018 line-up. The only changes that are worthy of mention are that Ford shifted a few different features around on the Explorer's multiple trim levels. Something that all occupants will love about the 2019 Ford Explorer is that it provides a quiet ride. Even with such massive tires equipped, the Explorer's cabin is so well-insulated that any noise that does come from the tires does not make its way inside. There is barely any wind noise to speak of either, and you will not notice any engine noise unless you crank it up to full-throttle on the optional turbocharged V6 engine. The cabin of the new Ford Explorer is packed with comfort regardless of where you end up sitting. Throughout the entire interior, you will find seats that are wide and well-bolstered, providing plenty of lateral support. The armrests up front are very well-cushioned, as are the ones in the second row unless you opt for the captain's chairs (which, in that case, do not have inner arm rests but are still quite comfortable). For quite a while, Ford struggled to give the Explorer a center console that was not overly sensitive to the touch. They seem to have finally gotten this problem fixed since the 2019 Ford Explorer has an easy-to-use infotainment system that responds well to the touch. Menu options make it easy to locate and use the controls, and even non-tech savvy drivers should have few issues getting acclimated to the set-up. All three powertrain options on the Explorer are excellent, but the 3.5-L turbocharged V6 engine that comes standard on the Sport and optional on the line-topping Platinum trim is really where it shines. This engine generates an impressive 365 hp and 350 lb-ft of torque, which is plenty of power to get the Explorer up and moving. Hit the gas pedal, and you will instantly and continuously feel the power this engine provides. Steering on the 2019 Ford Explorer has a remarkably refined feel that is uncharacteristic of a third-row SUV. The electric steering on the vehicle feels very well-tuned, and you can get the vehicle to quickly turn with precision. Also, steering feels natural. When you are moving slowly through dense traffic or a crowded parking lot, steering feels light. When you get on the highway, steering takes on a more appropriate bulk. Another element of the Ford Explorer's driving performance that stands out is its handling ability. There is not a whole lot in the way of body roll, so taking turns in the Explorer feels pretty secure. Also, with the stiffer suspension that you get on the Sport trim, you will find that the vehicle is better able to absorb rattles and bumps while maneuvering through corners. 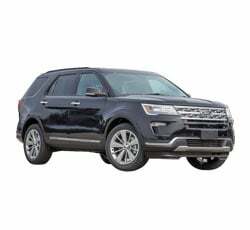 Acceleration on the 2019 Ford Explorer has a swiftness that cannot be matched by many vehicles in its segment. With the help of the refined 6-speed automatic transmission, the engine (especially the turbo V6) is able to get up to highway speeds in a mere matter of seconds. In fact, on the turbo V6, the Explorer has been clocked going from 0 to 60 mph in just 6.3 seconds, which puts it well ahead of many other third-row SUVs. Getting into the third row of many large SUVs in this class can be downright difficult. Thanks to some wide door openings and the availability of optional captain's chairs for the second row, getting into the third row is made a lot easier. Even without the captain's chairs, there is better access inside of the Explorer than there is in other third-row SUVs. The 2019 Ford Explorer has a sophisticated vibe going on throughout the cabin thanks to the abundant use of high-quality materials. The materials are soft to the touch and are all smartly paired together to create a cohesive look when paired with the trims you will find within. Even the base trim has an eye-catching look to it. Of course, the higher up you go in trim levels, the more high-quality materials you will find. Leather upholstery comes on the Limited and above trim levels, and the Platinum trim features stunning premium leather upholstery in its cabin. Braking shouldn't be a hassle on a family-friendly SUV, but some third-row crossovers seem to struggle with this concept. That is not so for the Explorer, as it has a pedal that is well-adjusted for in-town driving and can handle the highway just as well. If you opt to equip sticky summer tires, you will find that the Explorer can make a rather short panic stop from 60 mph in just about 108 feet. As you might expect from a vehicle in this segment, space is somewhat limited in the third row. While children will not have too many problems fitting back there, trying to cram a couple of adults in will prove to be problematic. There simply is not enough leg space for most adults to feel truly comfortable and relaxed. The fact that automatic emergency braking is not an available feature on the 2019 Ford Explorer is somewhat perplexing. Some of the Explorer's competitors come standard with automatic emergency braking as a part of their line-up of driver aids. This attractive safety feature is something that a lot of drivers want to have to help keep them and their vehicles' occupants safe. Adding it as a standard feature would make for another great selling point for the Ford Explorer. While forward visibility is excellent thanks to the huge windshield and slender front roof pillars, visibility in the rear is more restricted, especially if you get the second row captain's chairs added on. Drivers might want to choose to equip the optional parking sensors and will likely find themselves relying more extensively on the available driver aids to help them back out of parking spots and navigate heavy traffic flows. This is a very minor gripe and really only applies to the Sport trim. Some people might find that the Sport trim's stiff suspension is just a little too stiff and detracts a bit from ride comfort. This leads to feeling more of the bumps in the road than you otherwise would on the other trim levels. However, the trade off here is that you get improved handling capabilities, which is something that drivers who want a sportier feel will not mind. In terms of competition, this year will see a strong rivalry between Ford and Honda. The 2019 Honda CR-V has unparalleled cabin space and a best-in-class amount of cargo space, which is something that the Explorer cannot compete with. If you can forego third-row seating, then the five-seater CR-V should more than do with how much space it offers. Additionally, the CR-V delivers superb fuel economy, plenty of standard safety and infotainment options, and its turbocharged engine competes well with what you find on the 2019 Ford Explorer. Another one of the major competitors for the 2019 Ford Explorer is the 2019 Toyota Highlander. This year, Toyota has equipped the Highlander with numerous standard driver aids, including automatic emergency braking, which the Explorer does not have for some odd reason. Also, the Toyota Highlander has a fuel-efficient hybrid variant for drivers looking for a thrifty gas-sipper. Unfortunately, the Highlander has even less space in the cargo area and third row of seats than the Explorer. The 2019 Ford Explorer has a lot to offer in terms of power and performance. While it does not have the most spacious third row or the most expansive rear visibility, the Ford Explorer does offer a lot of attractive selling points. Drivers who want a sporty performance will likely fall in love with the Sport trim, and the other higher-level trims offer a decent amount of luxury for a non-luxury SUV. Overall, the new Ford Explorer is a user-friendly vehicle that offers up a fine mixture of comfort and prowess while on the road.